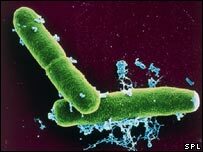 UK scientists have identified a way of using light to rapidly detect the presence of bacteria. The technology could have wide applications in wound healing, counter-terrorism and screening patients for MRSA infection. The team at Sheffield University are developing a portable kit in which specially designed molecules emit a light signal when bound to bacteria. Current laboratory-based detection of bacteria can take hours or even days. The team have spent five years designing special large molecules, or polymers, which can bind to cells. Once bound the polymer changes shape and emits a light signal. This can either be a coloured light, such as a red glow, or a light that is invisible to the naked eye but can be detected under a fluorescent lamp, depending on the type of polymer that is used. With funding from the Ministry of Defence, the researchers are now developing polymers which can attach to bacterial cells. Putting the polymers into a wound would show doctors whether there was a bacterial infection by the presence of a light signal. The technology would be particularly useful in a war-zone where laboratory facilities are not readily available, said the researchers. The kit, which could be available in three years, could also be used to detect deliberate release of bacteria, for example in an anthrax attack. Professor Sheila MacNeil, professor of cell and tissue engineering and one of the project leaders, said current methods of taking a swab and sending it off to a laboratory could take days. But with a light signal you would get "an instant read-out within a minute". Dr Steve Rimmer, from the department of chemistry, who is also leading the project, added: "We have already made the polymers which give you a light signal as they go through a shape change. "Eventually we'll be able to tell whether a wound is infected and we should be able to tell which type of bacteria it is." Professor Peter Hawkey, professor of public health bacteriology at Birmingham University, said more rapid tests to detect bacteria would be widely useful. He is carrying out work for the Department of Health to develop tests that can be used outside a laboratory, for example in a hospital ward, using a technique which amplifies and detects bacterial DNA. "We can get an answer within a lab within two hours, but this is very novel and could easily have application." He added it could be particularly good for detecting one pathogen, such as anthrax. "It's use could also be in screening for MRSA," he said. "If this could be developed it would be very interesting, but it would have to be sensitive enough."